It is my pleasure today to have as my guest, Renee Sanford. She and her husband David Sanford are professional writers of such calibre, that their interest in me over 8 years ago encouraged me in my desire to become a writer. They are the authors of Thriving as an Adoptive Family published by Focus on the Family, of which I am proud to be a contributor. It is in this book that I shared a brief version on what it felt like to be a birth mother. Below is an article that Renee wrote on how God shaped them into becoming adoptive parents. Have you ever thought of growing your family through adoption? If so, what was the first gift God gave you in your parenting journey of faith? As a couple, my husband, David, and I knew adoption was our heart’s desire for our family long before we were married. How did David know? First, he loved children! Second, he strongly resonated with God’s call to care for orphans and widows in their distress (James 1:27). Third, adoption played an important role in his extended family. I felt the same. My family first grew by adoption when I was nine. My parents heard about a little boy who was going to be placed in foster care because his mother’s degenerative disease had left her unable to properly care for her children. Through no moral fault of his mother, this little boy had experienced profound neglect. My parents welcomed that little boy into our home and later adopted him. Several years later, other families from our church were adopting children from the Philippines where missionary friends lived and served. Again, my parents felt God’s leading to meet the needs of an orphan child. A little girl this time, they decided. Two it was—two darling girls, aged one and a half and three years old. For me, as an almost thirteen-year-old girl, it was like having two pretty dolls (except when the littlest one threw tantrums!). For my parents, however, it meant embarking on an uncharted journey into parenting children who were adorable on the outside and hurting deeply on the inside. Little did my parents know what they were getting into. At that time, I remember my mother started listening to a new radio broadcast hosted by Dr. James Dobson. Because my parents had grown up in broken and neglectful homes, they took in whatever they could learn from God’s Word and ministries like Focus on the Family. God’s grace proved to be abundant as they poured into us children the love and nurturing they themselves had not received as children. Still, there weren’t all the tools available that my parents needed for the particular challenges of raising adopted children. They did the best they could, but they wish they had known more. Looking back, they would have done some things differently and, perhaps, everyone would have experienced a bit less pain. Thankfully, much research and attention has been given to the unique needs and concerns of adopted children and their families. Careful study and insightful listening has led to a better understanding of how to more effectively parent children who have experienced the loss of their birth family and/or the horrors of abuse. Resources and support are now available to adoptive families that were non-existent or hard to find in years past. All parenting is a brave journey of faith. After all, God alone can work the miracles of healing, health, and faith that we desire to see in our children and in our own hearts and lives. So, when God gives us the opportunity to truly meet our children’s needs and better love them in ways they understand, let’s receive those gifts with thanksgiving and praise. May God supply many such gifts to you and your family now and for years to come. 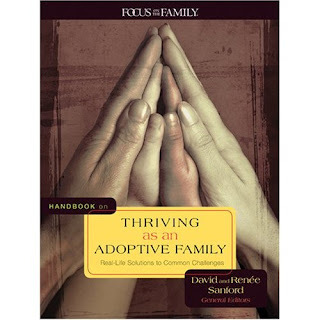 Renée Sanford and her husband, David, are the general editors of the Focus on the Family Handbook on Thriving as an Adoptive Family (Tyndale House Publishers). Click here on this link Thriving as an Adoptive Family if you would like to purchase this handbook.